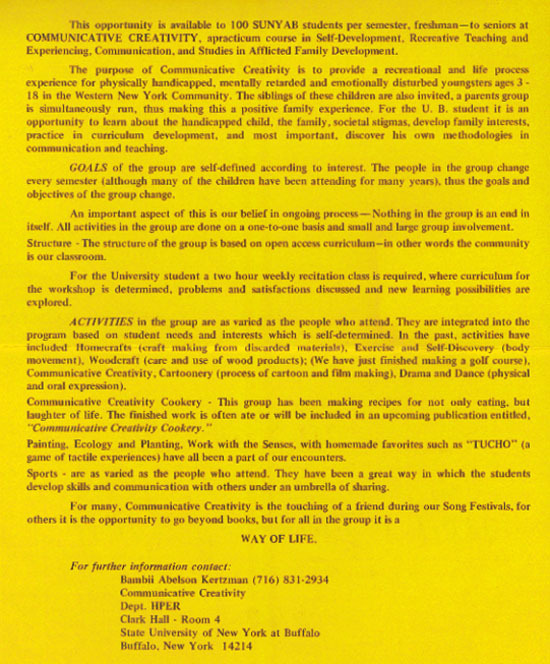 Article printed in the November 1973 Spectrum at UB. 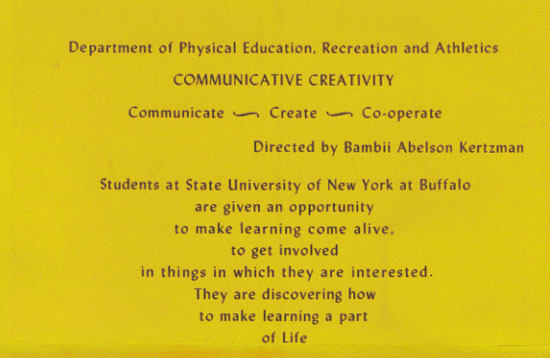 "One of the most significant courses that I took at UB was Communicative Creativity, which was developed and taught by Dr. Bambii Rae Kertzman. She would combine approximately 100 of Buffalo's children with disabilities with 100 UB undergraduate students. Each Sunday we would all meet at Clark Gym and have an experience together. I remember one week when Bambii rented wheelchairs for many of the UB students to use for the day and compete with the disabled students. Another week we would blindfold each other and walk around campus. 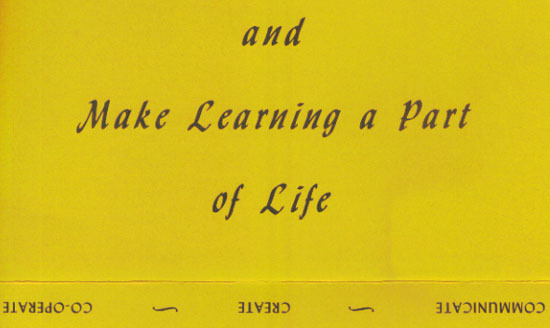 Each week was a different experience in learning what it was like to have to be different. After one semester as a student, I volunteered to be the intern for the next semester's class. That is why you can see a picture of me as Bambii's assistant below. We were cooking a soup for the 200 participants of the program for that Sunday. Dr. Kertzman and this course greatly influenced my approach to learning and respecting all people for the rest of my life. The course was truly ahead of its time." 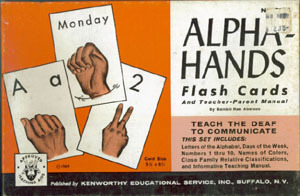 Bambii Rae was the creator of Alpha-Hands Flash Cards, which were used by UB students to learn how to communicate with the deaf. The set included the letters of the alphabet, days of the week, numbers 1 through 10, names of colors, and family relatives. The illustrations were made by her father Bernard. 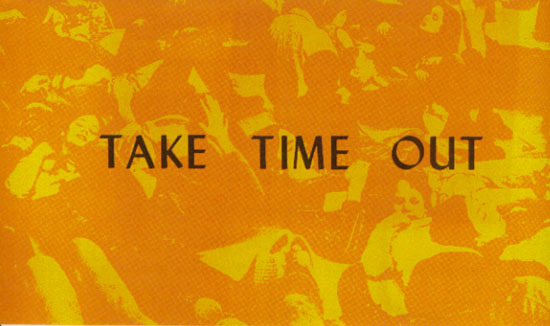 The set was copyrighted in 1969. 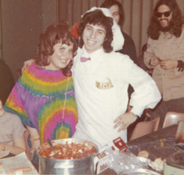 Bambii - Bambii and Rick in 1973 or 1974. Bambii and Rick in 2008. WHAT IS DR. BAMBII RAE DOING TODAY? "Rachel Girl Power - Running Against Bullying". Links for purchasing or reviewing the book will be added shortly. 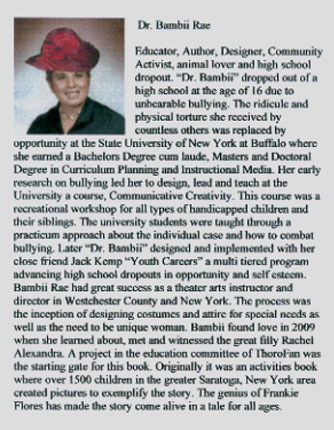 In honor of Rick Landman, author Bambii Rae has decided to donate a portion of her new book's proceeds to CBST! 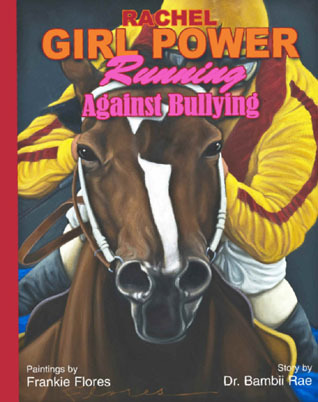 "Rachel Girl Power Running Against Bullying" by Bambii Rae is being released in stores July 2010. 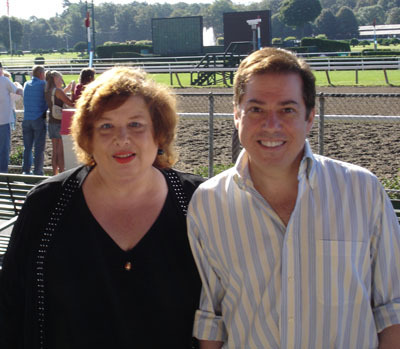 Book signing event will take place on Friday July 30, 2010 at 7:30pm in Flores Fine Art Gallery, 492 Broadway Saratoga Springs, NY.